Every now and then it’s nice to come across some free AutoCAD linetypes to use on that certain project. Since the AutoCAD program comes with various linetypes, such as continuous (solid straight line), hidden, dashed, center and dotted lines (and more! ), searching for free line types is something a CAD user may only need to do occasionally. As you'll see throughout our site, we've taken some of the leg work out of searching the net for useful AutoCAD additions. It is a good idea to download them all and store them in an easily accessible directory that you can sift through when needed. We have compiled a good list of resources below that offer these free line type additions for AutoCAD. ... and more, that we have compiled and listed on our site over time. 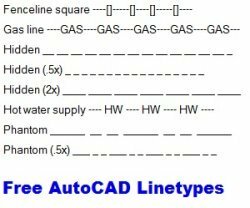 Free AutoCAD linetypes for drawing - Download the forest service's AutoCAD standards, including their line type files for various types of line styles to use in your drawing. Various Linetypes Collection - A very good selection of freebie line styles, including fire protection, electrical, intercom, nurse call, television, radio, piping, air conditioning and more. Curly Line Types - Self explanatory. Instrumentation Ltypes for AutoCAD - A nice selection of instrumentation style lines. .LIN linetypes - More useful styles of complex line types for AutoCAD and ACAD LT. If you are interested in learning more about working with linetypes, we suggest that you start with this tutorial.